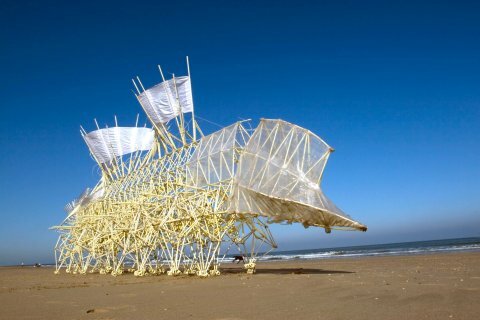 For the last 20 years maverick Dutch artist Theo Jansen has been building strange and wonderful creatures in his shed and allowing them to wander the beaches of Holland. Animaris Currens Ventosa, Oostvoorne, The Netherlands (1993). Courtesy of Theo Jansen. Photo by Adriaan Kok. 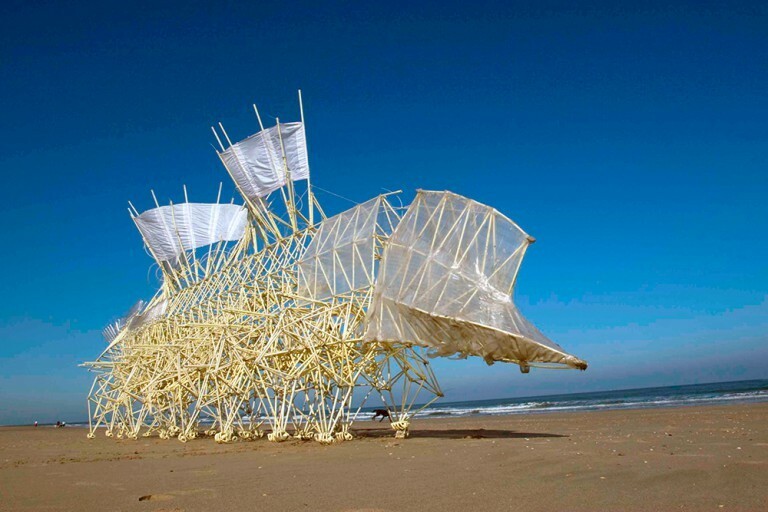 Theo Jansen’s remarkable inventions are part-vehicle part-artificial life. 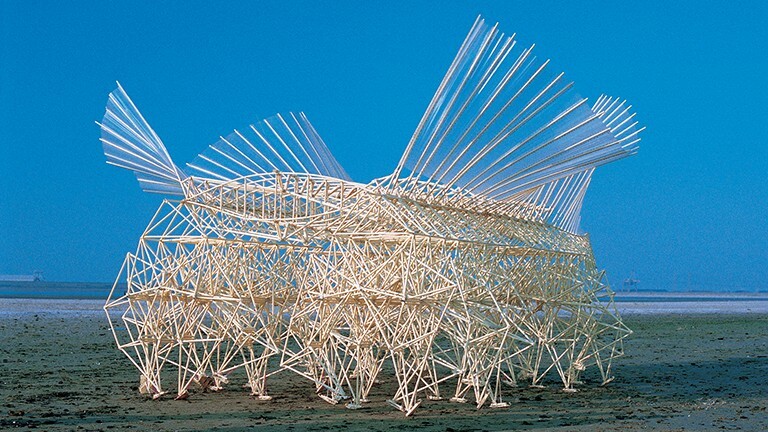 “I came up with the idea to build skeletons on the beach to save dunes – to save us from the rise of the sea level,” he says. But Theo’s original idea for automated sand-shovelling vehicles soon morphed into something far more interesting – a new species of artificial life-form powered by nothing more than the wind. 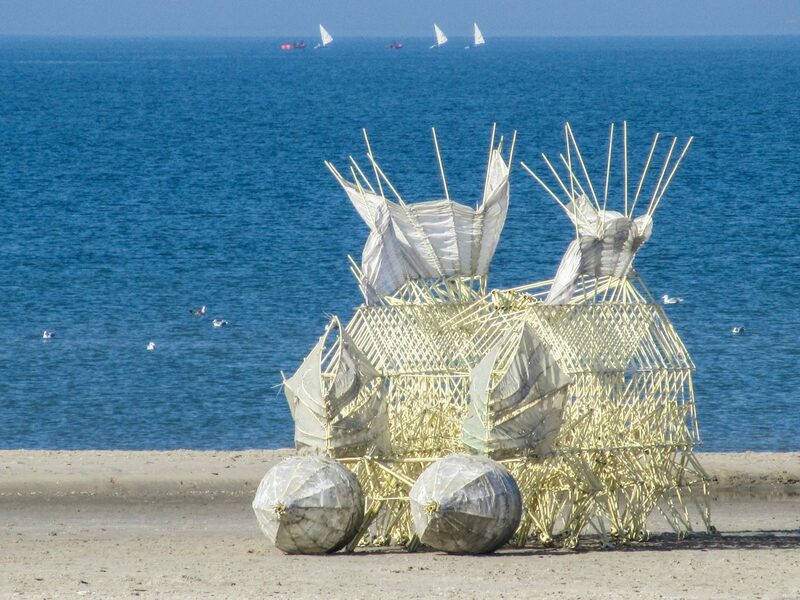 He christened them Strandbeests (dutch for Beach Beasts). Animaris Gubernare, Stille Strand (2011). Courtesy of Theo Jansen. To bring his machines to life, Jansen first needed to source a material that was cheap, strong – and most importantly – light. He settled upon a simple yellow tube that is seen everywhere in Holland. To an engineer they are just plastic tubes. 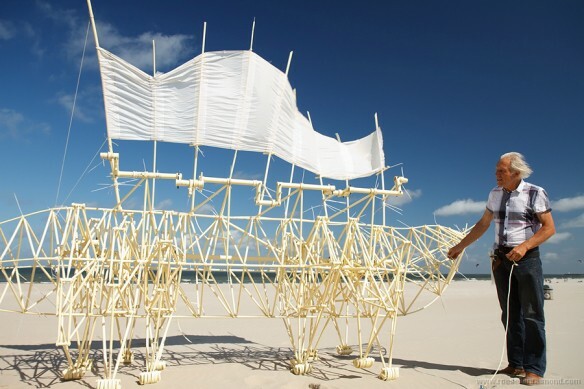 To Theo, they’re his invention’s basic building blocks.These are the cells of the Strandbeest– fit them together you can make a structure…. Finding the right building blocks for this new life was one thing – but giving them their freedom was an even greater challenge. Theo’s love of theatre, coupled with his passion for artificial intelligence convinced him he could make his vehicles walk by themselves – but how? Theo got to work. If the vehicle was to move, it would require long legs which could stride, a body that remained stable and feet that wouldn’t sink in the sand. So Theo got to work on his odd art project and designed them a wind stomach . Theo’s dream of creating a new form of Artificial Intelligence would appear to close to becoming reality – who needs cloning when you have plastic tubes and a shed on the beach?